Feminist pedagogy goals: effect social change; envision teaching as a political act; view knowledge as value-laden; value personal experience and self-representation; provide avenues for multivocality, and lead collaboratively in participatory environments. Through the Flower is a non-profit Feminist art organization founded by Judy Chicago in 1978. Their mission is to educate a broad public about the importance of art and its power in countering the erasure of women’s achievements. The Legacy section is intended to help students, scholars and museums locate aspects of Chicago’s oeuvre, in addition to her archives, which are split between the Schlesinger Library for the History of Women in America at Radcliffe/Harvard and Penn State University, which houses the Judy Chicago Art Education Collection. The Elizabeth A. Sackler Center for Feminist Art at the Brooklyn Museum in New York. 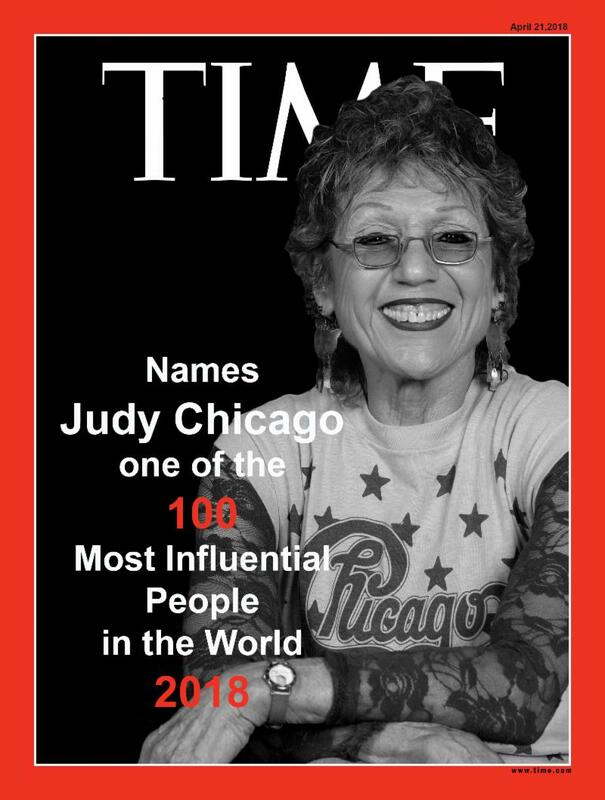 Judy Chicago named to 2018 TIME 100, its annual list of the 100 most influential people in the world (April 2018). “Judy Chicago” [interview] Frieze: Contemporary Art and Culture, 176. January-February, 2016. Judy Chicago is on Artsy: https://artsy.net/artist/judy-chicago. Artsy, has numerous exhibitions and posts about Chicago’s work, including “In Conversation with Judy Chicago, Icon of Feminist Art” by Christine Kuan. See https://artsy.net/post/christine-in-conversation-with-judy-chicago-icon-of. Ellen Berkovitc interview with Judy Chicago on October 17, 2011 in which Chicago talks about Feminism, The Dinner Party, Through the Flower, and the Judy Chicago Art Education Collection at the Penn State archives. Ten Questions for Judy Chicago Interview by Christine Kuan (November 10, 2010). Judy Chicago recounts the experience of being a woman artist in the 1960s and 1970s, when the art world was dominated by men. The Womanhouse Online Archive is a website, home, and resource for the historically significant Womanhouse, a 1972 site specific work, conceived of by Paula Harper and led by co-founders of the Cal Arts Feminist Art Program, Judy Chicago and Miriam Schapiro. In 2009 curators Suzy Spence and Leslie Brack researched and built a website on the occasion of their tribute exhibition, The Mood Back Home, an Exhibition inspired by Womanhouse at Momenta Art in Brooklyn. Oral history interview with Judy Chicago, 2009 Aug. 7-8, by Judith Olch Richards, for the Archives of American Art, at Chicago’s home and studio, in Belen, New Mexico. Hear Our Truths: The Creative Potential of Black Girlhood by Ruth Nicole Brown (2014). SOLHOT. Faith Wilding (a key participant in the Feminist Art Program at CSU Fresno and CalArts) spoke on the panel “Third Wave Feminisms” (2:44 min. excerpt) at Exquisite Acts & Everyday Rebellions: 2007 CalArts Feminist Art Symposium, a student-organized project that took place at CalArts on March 10, 2007. Add additional links or publication citations or resources at the Judy Chicago Art Education Collection Forum on Feminism and Art, or the forum on News and Events.